This is a short book (199 pages) that summarises a particular world-view of astrobiology that has almost vanished today. Working from the perspective purely of astronomy it aims to show that dust is widespread in space and that the dust shows astronomical signs (via extinction curves) for a variety of complex molecules. This is now surely accepted. 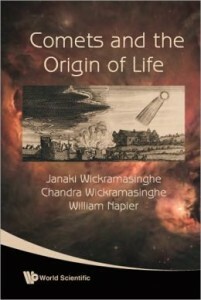 However, the book also contains the long-standing view of Sir Fred Hoyle and Chandra Wickramasinghe that some of these spectra can also be fit by bacteria and spores. This idea has never convinced a wide audience, and the book repeats the claim and lays out the logic behind it but does not advance the thesis further. The book then considers how dust might migrate through space, on comets for example, which then deliver material to planets. This is the idea behind some versions of Panspermia, which is discussed in some detail in the book. The work touches on many areas of interest to the astrobiologist and is a charming book but should not be taken as gospel. It contains several pages of references at the back that are worth looking at. Overall, I don’t think the book will convince anyone who does not already believe, but if you want to know about the Hoyle-Wickramasinghe thesis then this is the book for you.